Chinese consumers spent more than $25 billion US on Alibaba on Sunday, turning the e-commerce site's 'Singles Day' promotion into the world's biggest online selling event. China's largest e-commerce giant, Alibaba Group, said Sunday sales by the thousands of retailers on its platforms for the 24-hour period on Saturday amounted to 168.3 billion yuan ($25.3 billion US), setting a new record for the company. 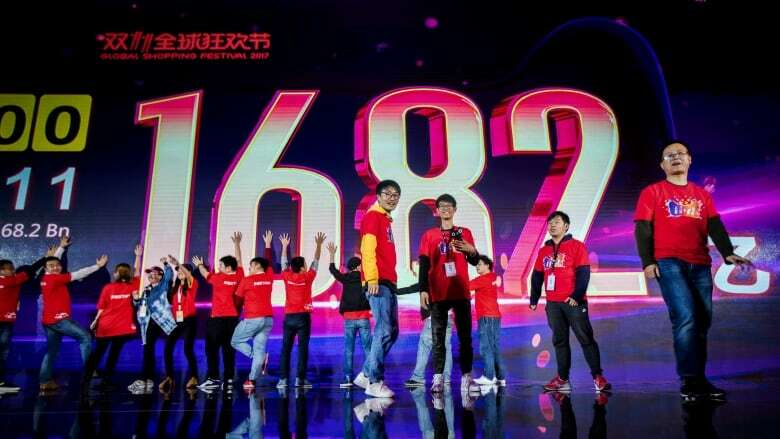 It was 39 per cent more than sales clocked last year on Alibaba's platforms of 120.7 billion yuan. By comparison, American shoppers last year spent more than $5 billion shopping online on Thanksgiving Day and Black Friday, according to Adobe, which tracks such data. Shoppers also spent $3.39 billion on Cyber Monday last year, the largest single online shopping day in the U.S., Adobe said. In China, Alibaba's main rival, online retailer JD.com, did not provide a sales figure only for Saturday but said cumulative sales over the 11-day period starting on Nov. 1 through Saturday totalled 127 billion yuan ($19 billion US). China is already the world's largest e-commerce market and the share of online shopping that makes up all consumer spending grows every year. Boston Consulting Group forecasts online spending will rise by 20 per cent a year, hitting $1.6 trillion US by 2020, compared with 6 per cent growth for off-line retail. The spending gives a boost to the ruling Communist Party's efforts to nurture consumer-based economic growth and reduce reliance on trade and investment. China has 731 million internet users, up 6 per cent from 2016, according to government statistics.